​At this years National Show 2016 Royal Cheshire - Kestle Females won first prize in 3 classes! They also won Reserve Female Champion and Reserve Breed Champion, Interbreed Mother and Daughter Champion and Reserve Interbreed Pair Championship. ​At the Royal Welsh the females again won Reserve Breed Champion. 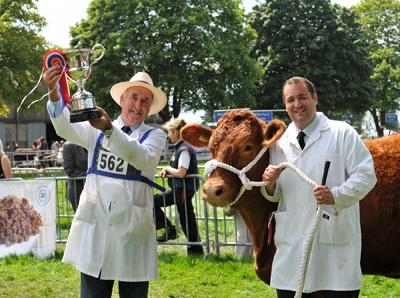 At the Yorkshire Show Kestle Tulip was Reserve female Champion. Liskeard, Stithians and Camborne Shows. our yearling heifer AI Kestle Dahlia 73 was reserve female champion at Camborne show, Female Champion and Reserve Breed Champion at Launceston Show and female champion and Breed Champion at Okehampton Show. Champion Female and Reserve Breed Champion , Kestle Tulip 85th who went on to win the interbreed champion cow bred by exhibitor and was also a member of the South Devon Pair that were Reserve Champion in the Burke Trophy. AI Kestle Dahlia 73 was 1st in the Yearling class. Kestle Emperor 3 was 2nd in the yearling bull class. Stock out of Kestle Cows also did well for Messrs Dimond and Pluess. Kestle Dahlia 60 was breed champion at the National show Norfolk and was also interbreed native champion. She goes on to continue to win many breed and interbreed championships. Kestle Tulip 85th was breed champion at the National show Three Counties and has gone on to continue to win many breed and interbreed championships. Kestle Dahlia 46th Winner of 16 breed championships including the last Royal Show and Royal Cornwall and many interbreed championships. Goffe Cave Sturdy Away is our new stock bull - he was Reserve Champion at the SDHBS Spring show and sale at Exeter 2014.